The Anaconda Plan is the name applied to a U.S. Union Army outline strategy for suppressing the Confederacy at the beginning of the American Civil War. Proposed by Union general-in-chief Winfield Scott, the plan emphasized a Union blockade of the Southern ports, and called for an advance down the Mississippi River to cut the South in two. Because the blockade would be rather passive, it was widely derided by a vociferous faction of Union generals who wanted a more vigorous prosecution of the war, and who likened it to the coils of an anaconda suffocating its victim. The snake image caught on, giving the proposal its popular name. 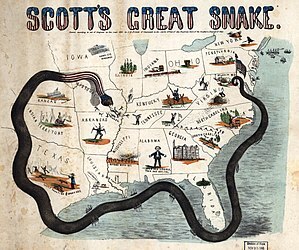 In the early days of the Civil War, Winfield Scott's proposed strategy for the war against the South had two prominent features: first, all ports in the seceding states were to be rigorously blockaded; second, a strong column of perhaps 80,000 men should use the Mississippi River as a highway to thrust completely through the Confederacy. A spearhead, a relatively small amphibious force of army troops transported by boats and supported by gunboats, should advance rapidly, capturing the Confederate positions down the river in sequence. They would be followed by a more traditional army, marching behind them to secure the victories. The culminating battle would be for the forts below New Orleans; when they fell, the river would be in Federal hands from its source to its mouth, and the rebellion would be cut in two. The complete strategy could not be implemented immediately, as no warships of the type imagined for the Mississippi campaign existed. The U.S. Navy was also too small to enforce the blockade in the first months of the war. It would take time to gather and train the forces needed to carry out the Mississippi thrust, time that the critics of the plan were unwilling to concede. Hence, Scott's plan was subjected to a great deal of ridicule. His opponents called for an immediate overland campaign, directed primarily at the Confederate capital of Richmond, Virginia. Their stated belief was that if a few strongholds were taken, the Confederacy would collapse. The conflict was not the brief affair that Scott's critics imagined. In the four years of war, the Federal Navy enforced a blockade that certainly weakened the South, although its effect on the war effort is still debated. Furthermore, the Confederacy was split in two by a campaign based on the Mississippi River, and a consensus has now been established that this Southern defeat was at least as important in the final collapse of the Rebellion as the land battles in the East that had so long attracted both public and historians' attention. The form of the Northern victory thus turned out to look very much like what Scott had proposed in the early days. Consequently, the Anaconda has been somewhat rehabilitated, and general histories of the Civil War often credit it with guiding President Abraham Lincoln's strategy throughout this period. The Anaconda had a logical development, both in its origin and the way it played out in the experience of battle. The blockade had already been proclaimed by President Lincoln. On April 19, 1861, a week after the bombardment of Fort Sumter that marked the outbreak of the war, he announced that the ports of all the seceded states, from South Carolina through Texas, would be blockaded; later, when Virginia and North Carolina also seceded, their coastlines were added. This executive order was not rescinded until the end of the war, so the blockade existed independently of Scott's plan. Because Congress was not in session to authorize Presidential initiatives to suppress the rebellion, the burden of raising troops for the war fell on the loyal state governments. Ohio was particularly active in doing so, and early acquired the services of George B. McClellan, who was to serve as the commander of its militia, with rank Major General of Volunteers. In a few weeks, as the state militias were incorporated into the national service, the militias of Indiana and Illinois were added to his command. From this power base, he felt enabled on April 27, 1861 to write a letter to General Winfield Scott outlining his strategy. He proposed an immediate march on Richmond, by this time the capital of the Confederacy, directed up the Kanawha River; alternatively, if Kentucky were to leave the Union, a march directly across that state should take Nashville, after which he would "act on circumstances." The Navy Department, however, remained committed to the idea of opening the Mississippi. The department, in the person of Assistant Secretary of the Navy Gustavus Vasa Fox, early decided on the capture of New Orleans by a naval expedition from the Gulf of Mexico, after which all other towns bordering the river would fall rather than face bombardment. The task of taking New Orleans was entrusted to Captain (later Admiral) David Glasgow Farragut, who followed his own plans for the battle; running his fleet past the forts that defended the city from the south on the night of April 24, 1862, he forced the city to surrender. After repairing his ships from the damage they had suffered while passing the forts, he sent them up the river, where they successively sought and obtained the surrender of Baton Rouge and Natchez. 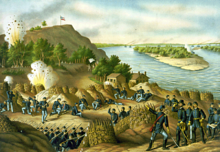 The string of easy conquests came to an end at Vicksburg, Mississippi, however, as the Confederate position there occupied bluffs high enough to render them impregnable to the naval gunnery of the day. By the time that Grant became commander in the West, the Confederate Army had been able to fortify Vicksburg and Port Hudson to the south. This 130 miles stretch (210 km measured along roads, somewhat longer on the river), including the confluence of the Red River with the Mississippi, became the last contact between the eastern Confederacy and the Trans-Mississippi. Having no doubt of its importance, the government of Confederate President Jefferson Davis in Richmond strengthened both positions. Command at Vicksburg in particular passed from Brig. Gen. Martin L. Smith to Maj. Gen. Earl Van Dorn to Lt. Gen. John C. Pemberton; the size of the defending army increased in step with the advancing rank of its commander. Scott's proposal for the blockade was not properly a strategy, although it is often referred to as such by historians. It did not estimate the forces that would be needed to guard the 3000 or more miles (4800 km) of coastline in the seceded states. It did not consider an allocation of resources. It did not set out a time line, or even name points of particular concern. Much of this was later done by the Blockade Strategy Board, a group meeting at the request of the Navy Department but also with representatives from both the Army and the Treasury Department (Coast Survey). During the summer of 1861, the board issued a series of reports recommending how best to maintain the blockade, taking into account the topography of the coast, the relative merits of the various southern ports, the opposition likely to be encountered, and the nature of the ships that would be used by both sides. The board recommendations concerning the Gulf coast were rather rudimentary and largely ignored, but the blockade on the Atlantic coast followed their plan reasonably closely. Although a century and a half has elapsed since the end of the Civil War, the importance of the Anaconda Plan remains to some extent a matter of debate. Clearly, the war was not the relatively bloodless affair that General Scott promised in his original proposal. Most historians regard this as merely a modification of the basic strategy in the course of events. At least one historian, however, denies that there ever was anything like a coherent strategy for subduing the South. Rowena Reed contends that the central government in Washington was unable to impose its will on the field commanders, so that the war was a series of independent campaigns, each of which was conducted according to the whims of whatever general happened to be in charge. According to her view, the Anaconda is a later, conceptual imposition of order on events for which order did not exist at the time that they took place. The worth of the Union blockade, however, remains controversial. No one seriously contends that it alone would have won the war for the North. But while it is conceded not to have been sufficient, the question remains: Was it necessary? That is, would the South have endured had not the blockade sapped the strength of the Rebel armies beyond the tipping point? Those who deny the importance of the blockade advance two principal arguments. First, it was never very effective. Over the course of the war, more than three-quarters of all attempts to evade the blockade were successful. The one-quarter that did not get through can be written off as operational losses. This was because the blockade runners were small, and built for speed rather than capacity. Second and perhaps more important, the Southern armies were not hamstrung for lack of material, at least owing to the blockade. The supply problems they did face were most often caused by the poor condition of the Confederate railroads. ^ Carol Reardon, "The Military Experience," in The Civil War Remembered, National Park Service Handbook, Virginia Beach, VA: The Donning Company Publishers, ISBN 978-1-57864-662-3, 2011. ^ ORN I, v. 4, pp. 156–157, 340. ^ Virginia, also a border state, had already seceded by the time the Anaconda was proposed. ^ ORA I, V. 51/1, pp. 338–339. ^ ORA I, v. 51/1, p. 339. ^ ORN I, v. 22, pp. 700–701. ^ ORA I, v. 10, p. 24. ^ Dufour, Charles L., The night the war was lost, pp. 265–286. ^ ORN I, v. 23, pp. 118–140. ^ Shea and Winschel, Vicksburg is the key, pp. 17–18. ^ Halleck was called to the East to become the new General-in-Chief in mid-July, about the time that Farragut had to leave Vicksburg. ^ Shea and Winschel, Vicksburg is the key, pp. 20, 36. ^ Shea and Winschel, Vicksburg is the key, p. 178. ^ Shea and Winschel, Vicksburg is the key, p. 200. ^ ORA I, 51/1, 369, 387. ^ According to historian Rowena Reed, much of the impetus for the Blockade Board came from Treasury Secretary Salmon P. Chase; the US Revenue Service, which would be strongly affected by the blockade, was a part of the Treasury Department. See Reed, Rowena, Combined operations in the Civil War, p. 7. ^ ORN I, v. 12, pp, 195–198, 198–201, 201–206; v. 16, pp. 618–630, 651–655, 680–681. ^ Browning, Robert M. Jr, From Cape Charles to Cape Fear pp. 12–15. ; ORN I, V. 6, pp. 119–145; ORA I, v. 4, pp. 579–594. ^ Browning, Robert M. Jr., Success is all that was expected, pp. 23–42. Interested readers may wish to compare Browning's (correct) account of the bombardment of the forts at Port Royal with the Official Records (ORN I, v. 12, pp. 261–265). Flag Officer S. F. Du Pont misrepresented the motions of his ships. Unfortunately, many historians continue to follow Du Pont's report. ^ Wise, Stephen R., Lifeline of the Confederacy, pp. 122–124. ^ ORA I, v. 6, p. 398. ^ Wise, Stephen R., Lifeline of the Confederacy, p. 260 (Appendix 9). ^ Simson, Jay W., Naval strategies of the Civil War., p. 70. ORN I, v. 12, pp. 416–424, 510–515. ^ Browning, Robert M. Jr., Success is all that was expected, pp. 172–180. ^ Browning, Robert M. Jr., Success is all that was expected, pp. 220–234. ^ Tucker, Spencer C., Blue and gray navies. pp. 259–267. ^ Browning, Robert M. Jr., From Cape Charles to Cape Fear, pp. 218–248. ^ Most of the trade of ports on the Gulf was with Havana; see Wise, Lifeline of the Confederacy, pp. 262–275. ^ Anderson, Bern, By sea and by river, pp. 228–230. ^ Tucker, Spencer C., Blue and gray navies. pp. 323–327. ^ Tucker, Spencer C., Blue and gray navies, p. 186. ^ Tucker, Spencer C., Blue and gray navies,pp. 329–426; ORN I, v. 21, pp. 397–601. ^ Reed, Rowena, Combined operations in the Civil War. ^ The blockade was successfully evaded more than 1000 times, compared with about 1300 attempts: Wise, Stephen R., Lifeline of the Confederacy, p. 221. The lack of railroad iron may have been one result of the blockade. ^ Anderson, Bern, By sea and by river, pp. 230–231. Elliott, Charles Winslow, Winston Scott: the soldier and the man. Macmillan, 1937. Reed, Rowena, Combined Operations in the Civil War. Naval Institute Press, 1978. US Navy Department, Official records of the Union and Confederate Navies in the War of the Rebellion. Series I: 27 volumes. Series II: 3 volumes. Washington: Government Printing Office, 1894–1922. This page was last edited on 8 March 2019, at 03:45 (UTC).